simple and easy potato raita for pulao and biryani dishes. firstly boil 2 medium or 1 large potato in pressure cooker or steamer. peel and chop the potatoes. in a bowl, whisk 1 cup fresh curd till smooth and keep aside. then add the dry spices - 1/2 tsp roasted cumin powder, 1/4 tsp red chili powder, 1/4 to 1/2 tsp chaat masala powder. also add salt as required. you can also use black salt. then add 1 tbsp chopped coriander leaves and 1/2 tbsp chopped mint leaves. 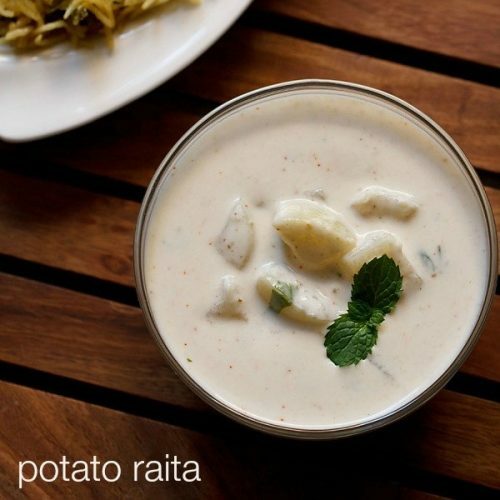 stir again and serve aloo raita with a veg pulao or any flavored indian rice. if not serving immediately, then refrigerate the potato raita. garnish with coriander or mint sprigs while serving. you can also sprinkle some boondi or sev while serving the raita. chaat masala - dry pomegranate seeds powder or dry mango powder/amchur.